40: "A Piece of His Heart"
Section 2: Death-T arc (第（だい）二章（しょう） ＤＥＡＴＨ（デス）－Ｔ（テイー）編（へん） Dainishō Desu-Teī hen) is the second arc in the Yu-Gi-Oh! manga. Yugi Mutou and his friends face the Death-T theme park, which Seto Kaiba created to get revenge on Yugi. According to Yu-Gi-Oh! Character Guidebook: Millennium Book, Yu-Gi-Oh! 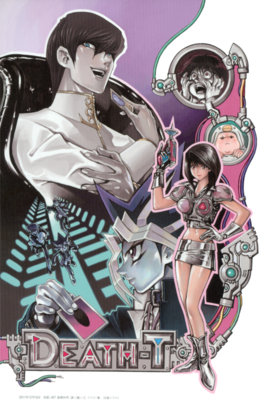 Duel 26: "Russian Roulette" is considered to be part of this arc. However in the Shueisha Jump Remix, it considered to be part of the School arc. Seto Kaiba invites Yugi and Jonouchi to his mansion, where they are to be treated as V.I.P.s for the grand opening of his secret project the next day. Mokuba still comes across as sinister, but invites the guests to a meal. Kaiba reveals his secret project, as he brings Yugi and Jonouchi to the grand opening of the indoor amusement part Kaiba Land. Yugi starts the first stage of Death-T.
Yugi, Jonouchi and Honda face Johnny Gayle, Bob McGuire and "name unknown" in the Stardust Shootout. The Kaiba Manor butler, subjects Yugi and his friends to the Electric Chair Ride. Yugi and his friends enter the Murderer's Mansion stage of Death-T.
Jonouchi is lured into a deathmatch with the Chopman. Inside the empty Death T-3 room, Yugi and his friends reminisce over how their lives have changed, before large blocks start to fall from the ceiling. As Yugi, Jonouchi and Anzu grieve over the loss of Honda, Yugi admits to thinking there is another Yugi inside him, before advancing to face Mokuba in the next stage of Death-T. Dark Yugi faces Mokuba in a game of Capsule Monster Chess in the penultimate stage of Death-T.
Seto Kaiba tries to inflict the "Experience of Death" Penalty Game on Mokuba for losing to Dark Yugi. Afterwards, Seto faces Dark Yugi in a game of Duel Monsters in the final stage of Death-T. Dark Yugi continues his Duel with Seto Kaiba. Yugi mostly plays defensively, while Kaiba maintains the upper hand, with his powered-up "Saggi the Dark Clown". Dark Yugi and Seto Kaiba continue their Duel in Death T-5. Kaiba Summons more copies of "Blue-Eyes White Dragon" making things more difficult for Yugi. With his life depending on what he gets, Dark Yugi prepares to draw his final card in his Duel against Kaiba. His only hope is to get the final piece of "Exodia", but he starts to doubt he can get it. After defeating Seto Kaiba, Dark Yugi inflicts the "Mind Crush" Penalty Game and Mokuba tells the story of how Seto grew-up to be the way he is.